From cylinders to chiptunes, music sure has come a long way in the century that followed Thomas Edison’s first phonograph. Explore the history of music technology with a curator led tour of In The Groove: A Century of Sound. What do you think of when you hear the words ‘computer game’? For most people, the term describes a game played on a computer or other electronic device. However, in the late 1960s and early 1970s, before the microcomputer revolution that would make computer games as we know them possible, people played computer games that had far more in common with Monopoly than they did with Minecraft. 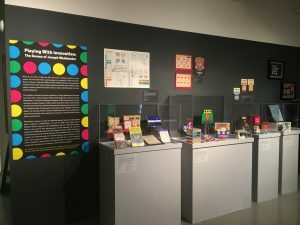 This exhibition features the game inventions of Joseph Weisbecker and both shows how these early computer games helped teach people how computers worked, and illustrates the growing interest in computers on a personal level in the mid 1960s through the 1970s. Weisbecker, a computer development engineer at RCA, had a passion for both education and game design. He filed a variety of patents related to game design and educational devices, and built prototypes with the hope of licensing them to toy companies. Many of these games were logic puzzles, designed to convey to players the workings behind computer programing, while others capitalized on the growing computer craze, referring to computers or computer terms in their titles or construction. Weisbecker’s interest in using the traditional media of games to teach people about computers complemented his work for RCA at the David Sarnoff Research Center, where he was developing an idea for a personal computer meant to be used for both playing games and for education. He called this concept the Flexible Recreational and Educational Device, or FRED. Weisbecker and his associates built several prototype microcomputers based on the FRED concept, and while these were not toys like the games he was building at home, these early computers shared a common goal with them. As this exhibition shows, Weisbecker believed that computers should be fun, whether their main components were plastic and marbles, or silicon and circuit boards. Innovations that Changed the World: An Introduction to the David Sarnoff Collection is a long-term exhibition that explores the state’s pioneering contributions to the electronics industry. 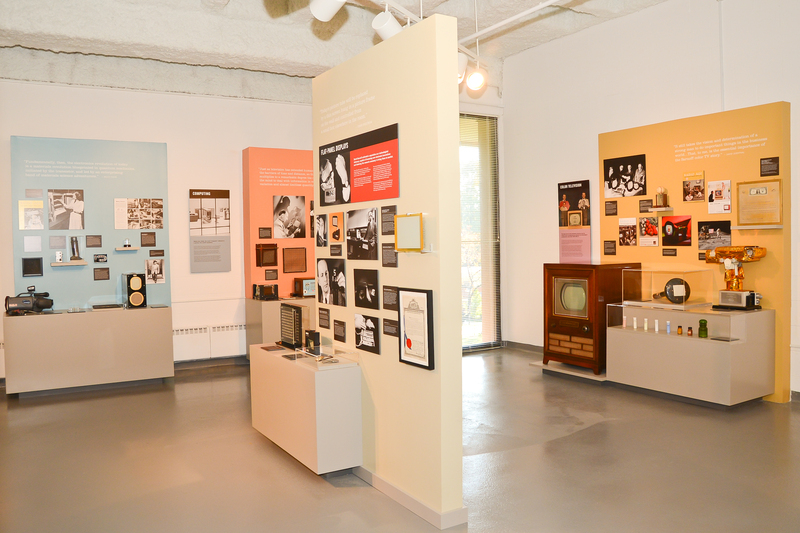 The exhibition traces the history of telecommunications from the invention of radio to the dawn of information age using objects drawn from TCNJ’s David Sarnoff Collection. Innovations That Changed the World allows TCNJ students and faculty, visitors, researchers, and local school groups to engage with over eighty artifacts from the Sarnoff Collection, as well as dozens of vintage photographs, letters, and advertisements. 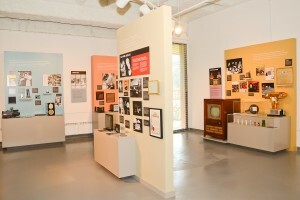 In addition to a biographical display highlighting David Sarnoff’s remarkable rise from impoverished immigrant to industrial innovator, the exhibition is divided into nine sections, each highlighting a different technology developed by RCA—radio, the phonograph, black-and-white television, color television, electron microscopy, computing, integrated circuits, home video, and flat panel displays. Visitors will not only learn about the scientific principles behind these technologies but also the social and historical contexts into which they were introduced. The exhibition is open to the public free of charge on Wednesdays from 1:00 to 5:00, on Sundays from 1:00 to 3:00, and by appointment for groups and school visits. The exhibition is located on the second floor of Roscoe West Hall. For a map with parking and building locations, please click here. For more information or questions, contact sarnoff@tcnj.edu.